Steff Taylor leads the business development activities for SlingShotTM within the Spectra Group. Spectra Group (UK) is a leading provider of voice and data services in areas where either none exist or where high intensity conflicts, natural disasters, pandemics or terrorist attacks may have destroyed existing networks. Q: The Spectra Group is well-known for providing ICT infrastructure and services in the most difficult of environments. Can you discuss that aspect of your mission in general, and specifically how that relates to the Tactical C4ISR needs of the modern warfighter? A: Spectra Group (UK) has built a solid reputation over the last 10 years for the provision of reliable and resilient voice and data services in areas that have little or no communications infrastructure either in remote areas or been destroyed by natural disaster or conflict. As we are predominantly staffed by ex-serving members of the Armed Forces we understand the true value of having these services available and have experienced first-hand the damaging effects when the communication services fail. That’s why we’re driven to deliver and we accept full responsibility for meeting our customers’ requirements. I think our approach and service offering has evolved to meet the needs of the modern warfighter. The nature of conflict has changed and so have the information requirement needs of the commander right through to the front line soldier. We have invested in providing the capability at the tactical level so that data can be sent and received in a timely and appropriate manner. Q: Specifically let’s discuss your SlingShotTM solution. I understand it was recently shortlisted as a finalist for the ‘Best Communications Product for the Soldier’ at the Soldier Technology Awards. Tell me a little more about the system, and the Award. A: SlingShotTM is a revolutionary advance in the provision of satellite capability to tactical radio users. We have been aware for many years that UHF TacSat is a limited resource that is only available to a small number of high priority radio users. As such it attracts a premium price. Also, it is limited in its ability to provide reliable and high quality communications on the move (COTM). Because of this we worked with Inmarsat to develop a complementary service offering what would provide a global solution for those armed forces that couldn’t get access to UHF TacSat. In October 2012 we received confirmation from Inmarsat that they could provide an L-band service that met our requirement and from this we developed a working prototype within one month that delivered a TacSat capability using a commercial satellite constellation. Interest in our capability grew quickly as defense users around the world understood the benefits of a capability that provided Beyond Line of Sight global connectivity using tactical radios. We were pleasantly surprised when we received the notification that we had been shortlisted for the best communications award as it came only six months after our first demonstration. Q: While it is an elegant solution, SlingShotTM is actually a very simple concept, isn’t it? A: SlingShotTM is a simple concept in that it provides BLOS capability to existing tactical radios without any change to in-service equipment or security. The system currently supports UHF radios and we will shortly have a system for VHF radios. Q: When it comes to communications, and especially Tactical Communications, compatibility with existing systems, Size, Weight and Power, and of course, security, are primary concerns. How does SlingShotTM Address each of these issues? A: When we started on this development path we knew we would only be successful if we kept in mind the needs of the user community. You’ve hit on the key development criteria that we had to get right in order to get buy-in. Our highest priority was to develop a system that was transparent to in-service equipment. As we do not change the output of the radio system in any way security is not affected. Basically, the radio operates in exactly the same way as it does in line of sight or UHF TacSat mode; what we are providing is a significant range extension. Depending on the satellite option chosen this could be many thousands of miles within a single satellite footprint or globally if switched between satellites. Second on the list of mandatory requirements were size, weight and power. Real estate on mounted platforms is limited and dismounted troops face a real challenge if technology reduces the amount of ammunition, food and water that can be carried. For that reason we worked hard to keep the footprint to a minimum and we have achieved that. We have also made the manpack system so that it can take power from in-service batteries. This means that the operator isn’t required to purchase different battery types and support different charging systems. We are very proud to have kept a full manpack system under 2kg with an operational life in excess of 72 hours between charges. Q: So what is the current status of SlingShotTM, has it been deployed? And if so, are you at liberty to discuss where? A: We are now in full production with all three variants (manpack, vehicle and maritime) of the UHF system. By the end of this year we will have the VHF system ready for deployment and at the end of Q2 next year we plan to launch the aviation system. Our future technology development will see a number of applications being developed to work with our systems, such as sensor control. Whilst we have focused on user demonstrations and trials during this year we have had successful deployments but these have not been made public as yet. I think this is an indication of the potential for success and I see 2014 being a big year for more deployments. Q: Can you give me a specific real world “in theater” scenario where and how SlingShotTM could be used/is being used by ground troops? A: As previously mentioned I believe the nature of conflict is changing and we will see more high tempo, short duration deployments and this is where SlingShotTM will come into it’s own. As a result of internal troubles a Non-combatant Evacuation Operation (NEO) has been planned and is about to be executed using troops from the EU. The force has a number of SlingShot™ systems and an active satellite lease provided by Spectra. 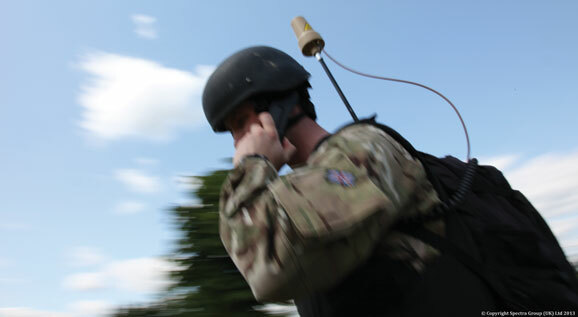 An early entry force is deployed, by air, and using the SlingShotTM aviation system continues to carry out mission planning using their secure UHF tactical handsets. Concurrently a naval detachment has taken an offshore position and is able to join the operational net and communicate with the early entry force. Both teams are using tactical radios and, despite being thousands of miles apart, have secure voice and data capability. On landing, ground troops disembark and move to the objective to begin the evacuation. During this phase they are still connected to both the air and naval platforms using the same radios. In addition the National HQ in the home base has connected to the tactical network and is maintaining a listening watch. Following a successful extraction the non-combatants are escorted to the waiting naval ship and the ground troops return to the airhead and depart. Throughout the operation all elements have maintained secure beyond line of sight voice and data communications on tactical UHF radios. This has been made possible due to the interoperability of the SlingShotTM system and the provision of a bespoke multi-headed satellite beam covering the whole area of interest. Q: Beyond SlingShotTM, and within what you are at liberty to disclose of course, what other kinds of Tactical Data Link (TDL) technology and/or SATCOM solutions is Spectra Group providing to the Military? A: For those users who require other mobile or fixed solutions Spectra can provide Inmarsat and VSAT services or a SHADE system. Spectra operates a VSAT network utilising partnered Satellite Ground Stations (SGSs) at strategic locations that provide global coverage. SHADE is a communication system that has been designed to enable multiple nodes to rapidly deploy and deliver voice and data services across any bearer to SHADE Central – a UK hub providing connectivity to the World Wide Web, ISDN, PSTN or dedicated private networks. Our network is fully redundant and SHADE Central is duplicated at a geographically separated location and services can be patched across within minutes in the event of a loss of services. Q: Briefly, as a company and as a solutions provider, what is it that is unique about your TDL and Satellite Technologies? What is it that you feel Spectra Group does differently than your competition? A: Our key differentiator is our detailed understanding of the challenges faced by military communicators. We have experienced first hand the challenges of maintaining secure voice and data communications in hostile environments. This drives us to ensure our solutions are truly fit for purpose. All our systems have been designed for ease of use and reliability thereby reducing the burden in the modern battlefield. Q: Again with what you are at liberty to discuss of course, can you share any feedback you have gotten from “boots on the ground” in the field regarding the use of your technologies? A: The feedback has been fantastic on both our SHADE and SlingShotTM systems. SHADE has been deployed with a number of user groups in the government sector supporting different requirements. Our end-users have reported positively on the ease of setting up SHADE in austere environments and the quality of service once connected. With SlingShotTM most feedback has been from demonstration and field trials. We believe in providing realistic demonstrations and, whilst this may be risky, it has proven to be most effective. We have left users to conduct their own tests in addition to ours. These have included successful high-speed vehicle and maritime trials with perfect results. My favourite moment came recently when a senior person from the user community was unable to attend a demonstration. On the spur of the moment I suggested driving one of the vehicles to his office to show the system. He was surprised how easy it was to join our network and talk to our location. But he was equally impressed with the quality of the connection, the flexibility of the system and the confidence we had in adapting our demonstration ‘on the fly’. Q: Without revealing anything that may be proprietary, what do you see as the next major development for Tactical Data Links and/or SATCOM for Military and C4ISR operations – and what is Spectra Group doing towards achieving that goal? A: My personal view is that having proved SlingShotTM for secure voice and data we should look at how we can support the integration of remote sensor control. Sensors are becoming more prevalent to both the military and other government departments, whether for border security or ISR. Developing SlingShotTM as a low cost, reliable system which can be monitored from great distances will give our user community a suitable option to meet this requirement.